We are quickly nearing the end of the fourth season of Game of Thrones on HBO, so if you haven’t already, it’s time to pick a side. Whether it be House Targaryen, Lannister or Stark, you can now fly your favorite house’s banner on your phone to show your allegiance. This new Muzei add-on was created by using the artwork of Nickorama144, who put together a few stylized images of the major houses from Game of Thrones. 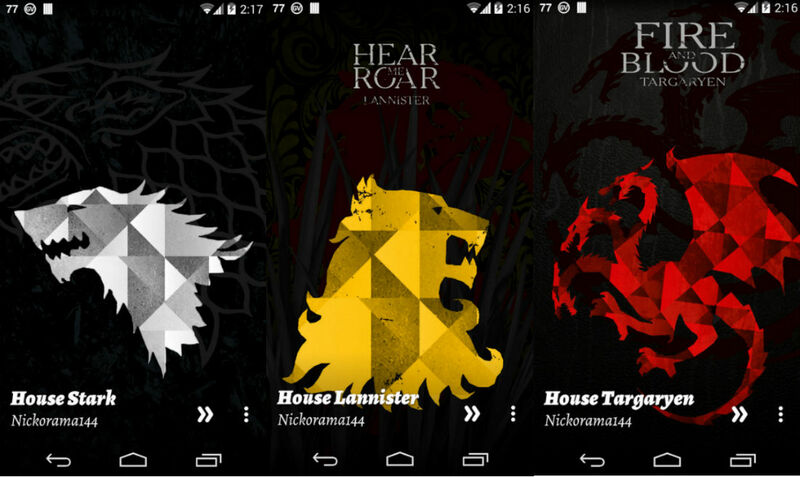 In addition to the three mentioned earlier, House Baratheon and House Greyjoy are included in the app. Users also get to choose whether they would like text included that touts the house’s saying, or just the sigil itself. The developer plans to add more to the application as quickly as the art is completed. As a Muzei extension, it works similar to any other additions in terms of picking your background of choice. And to top it all off, the app is free to download. If you can’t wait until Sunday for the new episode, hit the link below.